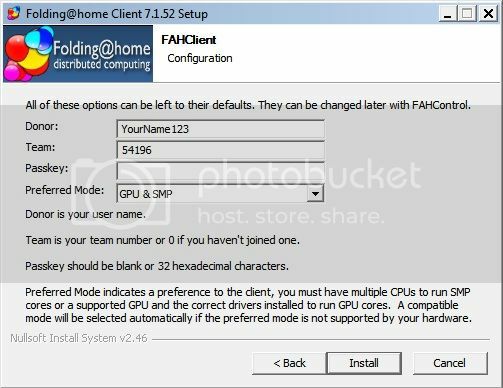 This guide is for people completely unfamiliar with Folding at Home and will guide you through the installation of V7 Folding Client. V7 is by far the simplest FAH client, and in most cases you can just 'set it and forget it'. 3) Under "Donor" Enter your Folding Name. To See if your chosen name is available, Click Here. 5) Visit FAH - Passkey. Copy and Paste the Passkey from your inbox into the 'Passkey' box. 6) If you have a discrete GPU as well as a CPU, select "GPU and SMP". If you only have a dual core or better CPU, select 'SMP'. The V7 client should install itself and configure the SMP and GPU clients automatically. Voila, you are now folding. To check your FAH Stats, visit www.extremeoverclocking.com - Folding Stats and input your FAH user name. I'll add basic use of the V7 client over the next few days as I get time. Last edited by great_big_abyss; October 22, 2012 at 11:41 AM. You forgot the "how to" for GPU folding. It automatically sets up when you install the client...so I'm not sure what you mean. Show me what you mean, and I'll fix it. Last edited by great_big_abyss; October 3, 2012 at 02:32 PM. Nope, g_b_a has it right. The V7 client automatically configures itself for SMP and GPU folding. For anyone with less than 16 logical cores, this is the way to go. Edit: and you appear to be missing some images? They don't for me, that's why I mentioned it. Where are you hosting them? Last edited by great_big_abyss; October 3, 2012 at 04:11 PM. Good work. Great start to the folding season gba! Stuck. I'll add to the folding intro thread as well. I have this running on my main PC which is AMD 1100T be watercooled CPU I am not sure what the safe temperatures are for my CPU because I was onlinegaming playing Path to exile with this running in the back ground ( CPU folding) and my temperature was 69c which I think is hot for this cpu . I ended up pausing folding but is this a safe temperature for this cpu and if not how do I turn of some cores ? Seems warm to me. My 1055 holds steady at 53-54C under full load. When gaming, the folding application should automatically dial back so that it only uses the unused cycles of your cpu. It seems to me like you have a problem with your CPU cooling, or too high of an overclock. What is your OC, and what is your cooler? I had to dial my 1055T back from 4.0Ghz to 3.8Ghz and reduce the voltage so that It would have a safe 'every day' temperature. My CPU runs at full load 100% of the time.